How Pete Seeger Revealed The Power Of Music To Me The death of Pete Seeger this year has NPR's Eric Westervelt reflecting on how the folk legend convinced him that music could create community and possibly foster change. 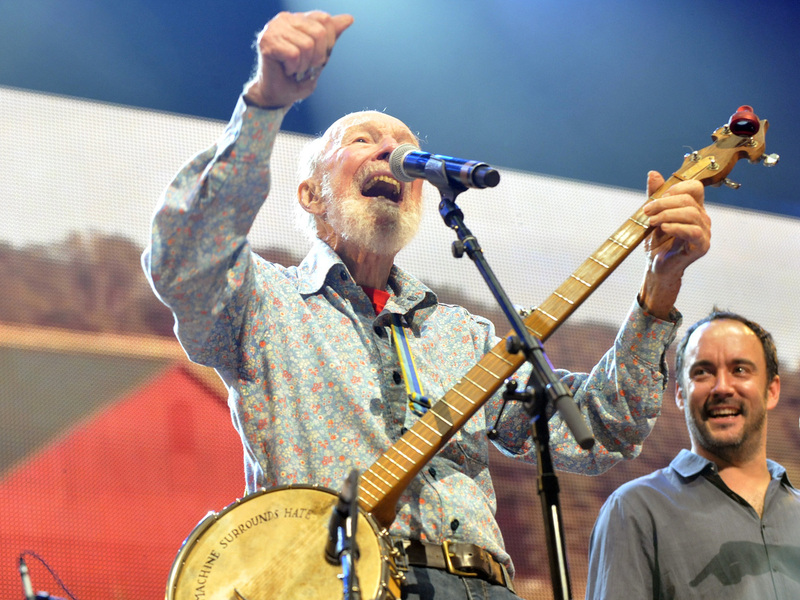 Pete Seeger performs on stage during the Farm Aid 2013 concert at Saratoga Performing Arts Center in Saratoga Springs, N.Y.
Before he died this year at the age of 94, Pete Seeger influenced scores of musicians and millions of people — including me. Growing up, my father would regularly drag me to folk festivals up and down New York's Hudson River Valley and across the Northeast, especially Pete Seeger's annual gathering called Clearwater's Great Hudson River Revival. What were all these fiddles and banjos and acoustic guitars, I thought? I wanted snarling electric guitars. Feedback. To rock. And here, old people would break into three-part harmony in line for the bathroom. My brother and I derisively started calling folkies "hey gangers" after one overly-cheery stranger greeted us one afternoon with a big, smiley "Hey gang!" It was annoying. My teen mind was not inspired. Off to see the "hey gangers." I wanted Jimmy Page. I got Pete Seeger. My dad would tell me, in essence, you'll thank me later. I'd never heard live jazz before, let alone one of its main architects. This was different. Amazing. My teen brain was now mesmerized. Later on, a gospel and blues voice stopped me in my tracks. It was the singer-songwriter and civil rights activist Odetta. Seeger later joined her onstage for a version of "Take This Hammer" and the powerful song based on a Langston Hughes poem, "Backlash Blues." Here was the blues like I'd never heard it before. At Seeger's riverside musical commune you'd get to hear, and sometimes meet and chat with, musical gems including Taj Mahal, Doc Watson and scores of less well-known great musicians. When I saw Peter Seeger perform there, several times, he had this steady charisma. His eyes sparkled with confident conviction. Seeger had a way of getting you to sing along, to sing out, to join together. Dad was right. I did thank him later. For me, at a Pete Seeger concert, I started to feel that maybe music could actually help create community — just might bring people together, and foster change. And the annual festival Seeger helped found plans to continue in his spirit.